So, one of your best friends just got married! How exciting! Now you just can’t wait til she gets back from her honeymoon so you can talk about what a beautiful wedding it was. 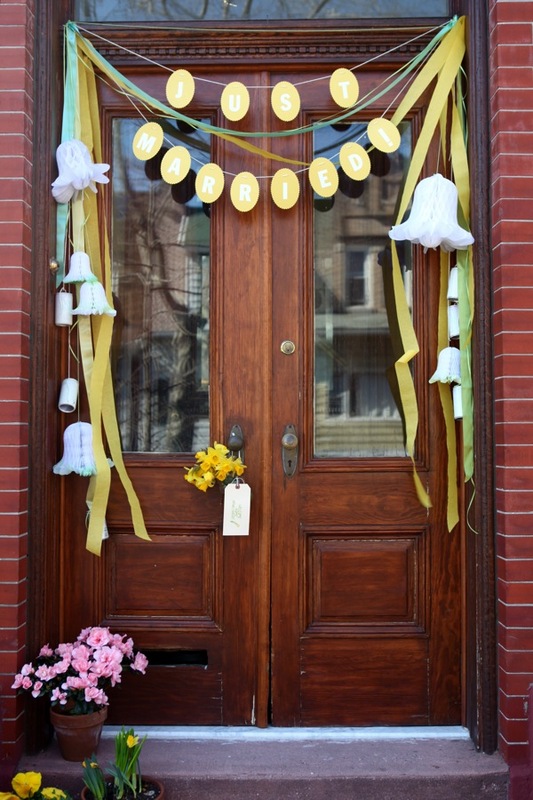 You know the exact date she’ll be returning to her home, so why not surprise the newlyweds with a beautifully decorated ‘just married’ front door. Materials needed: scalloped paper ovals (I used Paper Source’s scalloped oval cards in curry), 2-inch vinyl press-on letters (available at most office supply stores), yarn or string, assorted ribbons and streamers, a hole-punch, and expandable tissue paper wedding bells in different sizes (I found these at my local dollar store). Step 1: Peel off your letters and center them on the paper cards. Punch two holes on the top of the oval. Thread the yarn or ribbon through the holes to create your garland. Be sure to thread the yarn from the back side of the card each time for consistency. 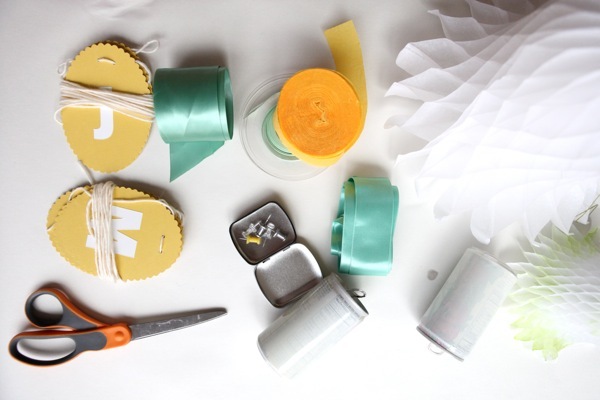 Step 3: Hang your garlands, bells, ribbons, cans and streamers. 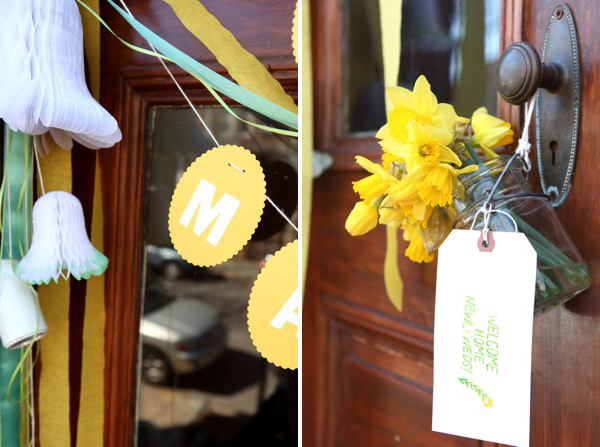 For a cute touch, I also hung a little mason jar full of flowers from the doorknob, with a little note letting them know just who left their surprise. Step 4: Run away! Oh yes, and hope it doesn’t rain! Great idea – would definitely be the cherry on top of the cake for the newlyweds! What a nice thing to come home to! AHH! I love it! I am getting married next month and what fun it would be to come home to. I also have friends getting married and I am going to do it for them. How fun! This is really nicely done. Just love how it seems like it naturally fell into place that way. Thanks! this is a great idea, i once saw a newly wed couple who hung fruit outside their new home to absorb ‘bad energy’ – the more the fruit dried the more energy captured! a bit kooky but it was beautiful! That is so sweet!!! Love the decoration! How fun! I made a (much less elaborate!) congratulations door decoration for a friend once and she LOVED it! I wish I would have done this a few weeks ago when my sister got married I love it! Wonderful! How lovely to come home to this lovely surprise at your front door. This is THE cutest idea, Jordan! What a treat it would be to return home to this! Oh my goodness, so cute! This will be a fun idea for all the weddings ahead! I want one of my friends to get married, just so I can do this!! What a sweet and gracious idea! 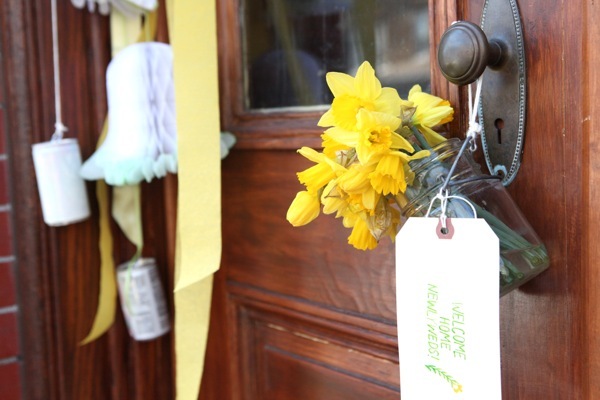 Would be wonderful for welcoming home a new baby, too! What a fantastic and thoughtful idea. It’s just beautiful and would make such a warm welcome home. This is such a sweet idea! How lovely to come home to. How adorable and special! What a sweet little sentiment. What an adorable idea! I’d love to pull something like that off. Unfortunately I don’t have any friends getting married anytime soon. Pity! 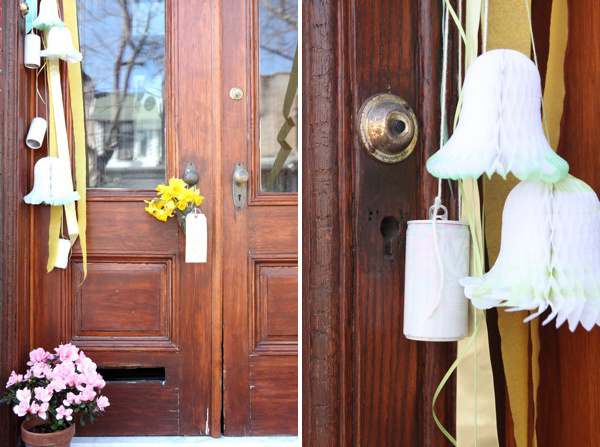 This is such a cute idea for a friend who is getting married! This is such a cute idea! What a cool surprise!